Have I told you guys how much I love Mexican food? If you couldn’t tell by now, it’s my jam. 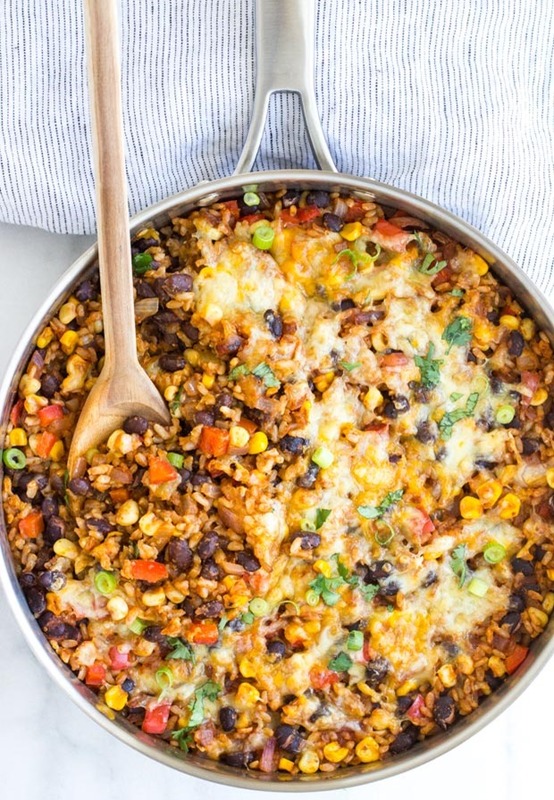 Alright, so let’s take a look at how easy this casserole is to make. 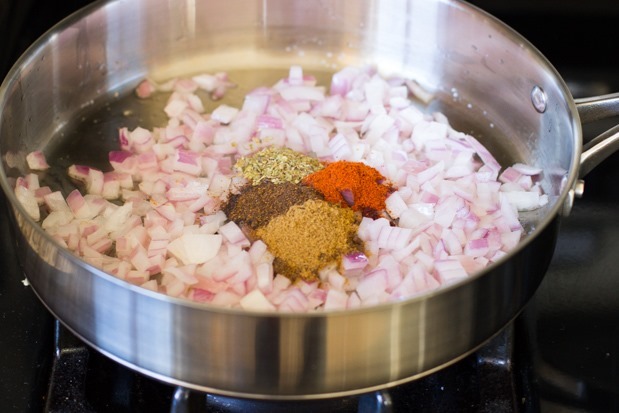 You start by cooking the onion with the spices over medium heat which creates a base that’s packed with flavor. 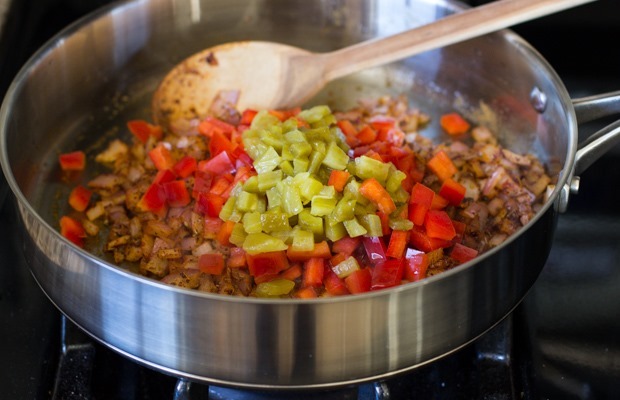 Then you stir in the diced bell pepper and green chilies. I used canned green chilies but you can use fresh jalapenos if you prefer. Just make sure to remove the seeds if you don’t want it to be spicy. 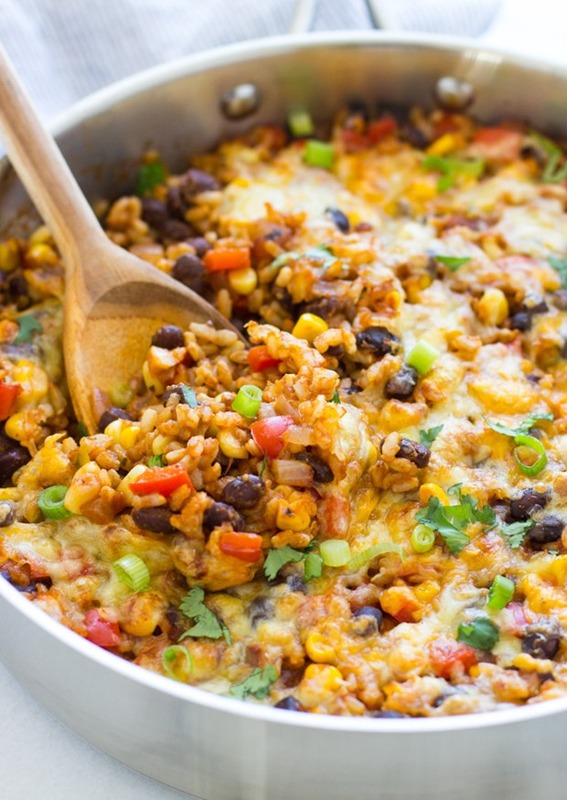 After those cook with the onion and spices for a few minutes, you add the rinsed beans, corn, brown rice and salsa. I used a roasted yellow chili salsa from Trader Joes but you can use whatever brand you like or even enchilada sauce, if you want. 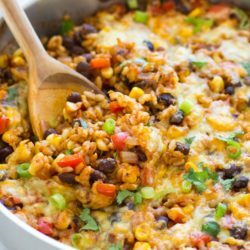 Once that’s all stirred together, you top it with shredded cheese, pop it in the oven and broil until it’s golden brown and bubbly and smelling delicious. Then dinner is served. I hope you enjoy this meal as much as we do! If you decide to make it please let me know how it turned out in the comments below. Your feedback is always greatly appreciated! Start by warming the oil in a large skillet (mine is 3 quarts) over medium heat. 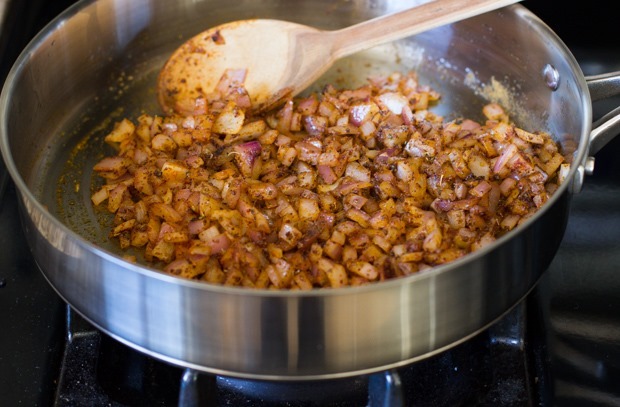 Add the onion and cook for 3 minutes, then add the spices (cumin to oregano) and stir together. Continue to cook for another 2-3 minutes. Next add the red pepper and the green chilies and stir together. 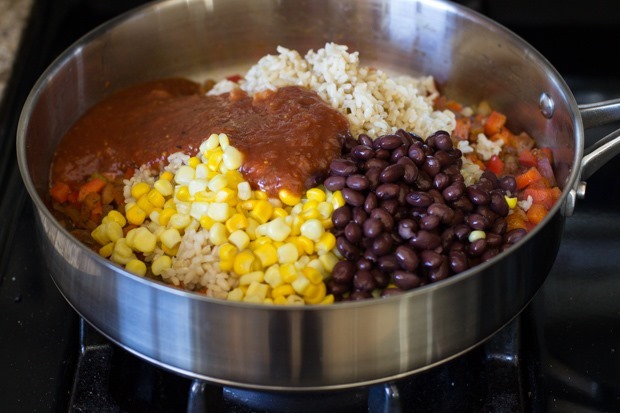 Cook for another 2-3 minutes then add the drained and rinsed beans, corn, salsa, and rice. Stir everything until well-combined. 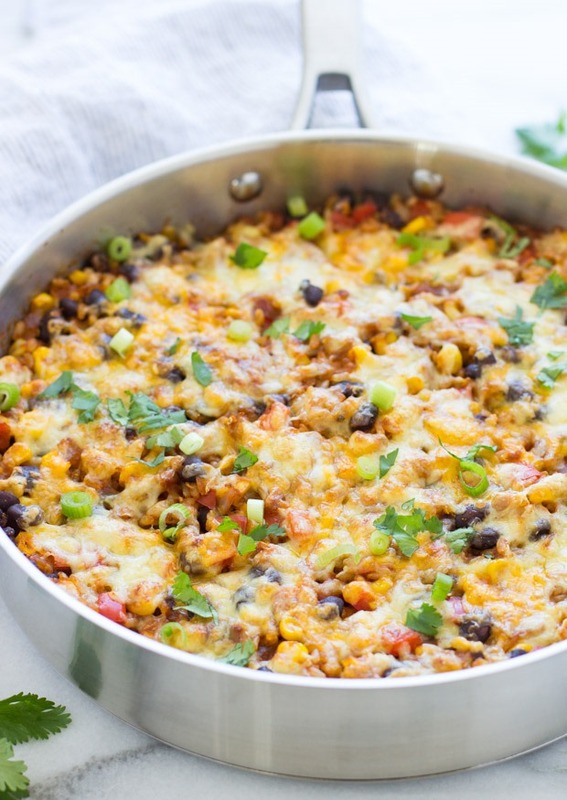 Turn the oven to broil then top the mixture in the skillet with the shredded cheese. 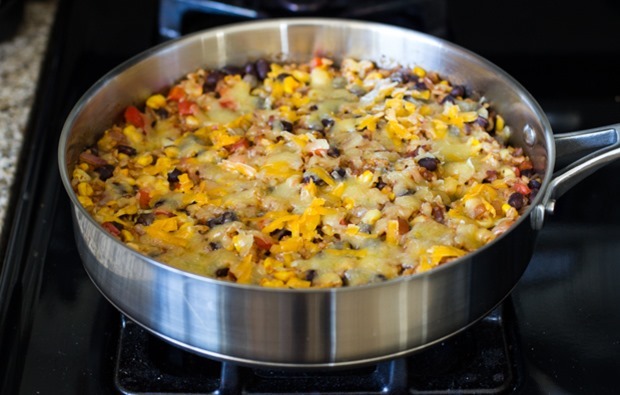 Place the skillet in the oven and cook for about 3-4 minutes until the cheese is golden and bubbly on top. Serve warm with diced green onions, cilantro, and/or avocado.